Croatian Mainland along Croatian part of the Adriatic Sea consist of a three distinct areas: Istrian peninsula in the Northwest, Kvarner - a stretch of coast around Bay of Kvarner and Dalmatia - a strip of mainland between Kvarner and Montenegro coast. 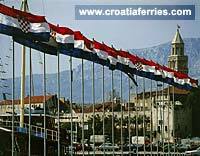 The main cities and ferry ports on Croatian mainland are Rijeka, Zadar, Sibenik, Split and Dubrovnik. They are all connected by various ferries to nearby islands and their archipelagos. Croatia is blessed with a beautiful coastline which is best explored by ferry to access the hundreds of islands...Read more about Croatia..